'A stitch in time saves nine', or as SPAB founder William Morris put it: ‘Stave off decay by daily care’. However you look at it, avoiding major, costly works to places of worship through cheap and cheerful regular maintenance has to be a good thing. The Maintenance Co-operatives Project is all about providing free practical support to the dedicated staff and volunteers who take care of some of Britain’s most treasured heritage. The SPAB has long taken a keen interest in historic churches and chapels. Approximately five per cent of all listed buildings are places of worship, but this figure jumps to 45 per cent if you just look at Grade I listed buildings. Because the SPAB is a statutory consultee in the planning process, as well as the Church of England’s faculty process and its equivalents in other denominations, places of worship form a significant proportion of the SPAB’s casework. The society sees first-hand the importance of religious architecture to the landscape of British heritage and to British society, and it is not alone in this view. Research recently published by the National Churches Trust shows that over three quarters of the British public, regardless of their religious persuasion, feel that churches and chapels form an important part of the nation’s heritage. However, the SPAB is also keenly aware of the challenges faced by those looking after faith buildings. Balancing income, faith use, wider community use and the general public’s expectations with often complex maintenance needs can feel like an impossible juggling act for those responsible for their care. The challenges are even more acute where congregations are small, geographically dispersed or physically unable to carry out maintenance. This is where the SPAB can help. Its wealth of knowledge and expertise is freely available and the society aims to help people enjoy their places of worship and see them as assets rather than as a burden that detracts from mission. The concerns of those taking care of places of worship differ from those of private owners of listed buildings, and the SPAB has been working hard to provide programmes tailored to the former’s needs. Back in 2007 the SPAB launched the Faith In Maintenance programme (FiM), supported by the Heritage Lottery Fund (HLF). A one-day training event covering all aspects of caring for historic places of worship, took SPAB deputy director Sara Crofts all over the country. By 2012 she had delivered 150 training days to over 5,000 volunteers, who also received a maintenance calendar, book and DVD. The course was a huge success, winning a Europa Nostra award for education, training and awareness-raising. When demand remained high in 2012 English Heritage stepped in with further funding, covering 60 per cent of the running costs and allowing the SPAB to continue to offer the day at a subsidised price of just £500. Feedback from FiM was positive but one important aspect of the programme needed further development. Maintaining buildings is not just about knowing how, why and what needs to be done, but also about having the capacity to actually carry out those tasks. That means having systems in place and trained people on the ground who are willing and able to assist. For many places of worship this is easier said than done, and it was this capacity shortage that led to the creation of the Maintenance Cooperatives Project (MCP). This three-year, £1.2 million project is primarily supported by the HLF, which recognised the value of pooling volunteer resources that the project presented. The idea is simple: bring together a number of places of worship in an area and help them put together a trained group of volunteers which can carry out preventive (non-invasive) maintenance, sharing equipment and expertise, and saving time and money. In order to achieve this the SPAB has assembled an eight-strong team, including five regionally based project officers, each working to found co-operatives in their area and support them over the life of the project with training, volunteer recruitment and organisation. The project also has its own dedicated technical officer, James Innerdale, an architect with long experience of the society’s technical work. The team is supported by an administrator and project manager. Each place of worship that takes part receives an information and launch event given by their regional officer, and a baseline survey day. James has developed an easy-to-use survey tool that can be downloaded free of charge from the MCP website (www.spabmcp. org.uk/co-op-toolkit). The tool is designed to assess the condition of each part of the building and the associated training helps volunteers to understand what needs to be done to keep it in good condition and, crucially, to spot small issues well before they become big expensive problems. Often this can be as simple as matching a green patch inside with a cracked gutter outside. 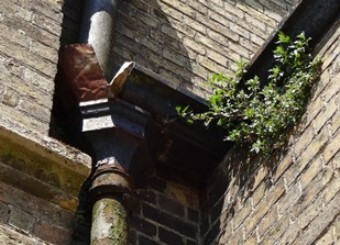 Finding it early can mean the difference between a quick gutter repair and an expensive roof timber replacement – or worse. Once the survey is complete, the findings are used to compile an annual maintenance plan and to establish what is needed to carry out the plan. That might be volunteer recruitment, equipment sharing or tailored training days. The idea is to distil what can be a never-ending and daunting task into a simple and planned set of activities which participants have the confidence to carry out. It is not designed to encourage non-specialists to carry out invasive or corrective work to buildings. In fact quite the opposite, the project can’t always prevent the big jobs, they still inevitably crop up or are already present. When needed, the MCP team can help participants understand what needs to be done, how to employ – with professional support – an appropriately qualified and priced contractor who understands the needs of their building and, if necessary, help them to understand the faculty system. Spotting and responding to minor defects quickly can prevent them from developing into larger, more expensive problems. Where a specialist contractor is needed the cost can be spread if other buildings in the co-operative need similar work, an idea already successfully promoted by SPAB allies Maintain Your Heritage through their ‘GutterClear’ programme. Where a building has a quinquennial inspection regime the MCP survey and maintenance plan is designed to work alongside it, referencing its findings and dealing with issues that might crop up within a five year period. At the end of the project’s first year approximately 20 co-operatives are up and running across the five project regions: South West, North East, Herefordshire and Worcestershire, Lincolnshire, and Cumbria. Over 40 events have taken place attracting a total of around 600 delegates. It has been quite a learning curve. What a co-operative looks like, how many buildings take part, how it is run and the type of activities it carries out vary widely from place to place. This gives a strong local flavour to each group and means that the project responds to local needs, but it also means that the MCP team needs to approach each new co-operative slightly differently, getting to understand what they want to get out of being involved. A co-operative in Cumbria is responsible for the fragile William Morris Lanercost Dossal, an embroidered wall-hanging of exceptional artistic and historical significance. The team there has emphasised what is essentially collections care, taking part in textile conservation training that has given them the confidence to understand the highly sensitive annual cleaning programme. In the South West the Melbury Team co-operative started out with a series of practical gutter clearing days. 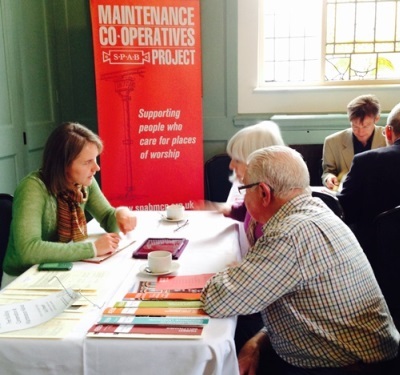 The Herefordshire and Worcestershire region has seen co-operatives mushrooming all over the two counties as word about the benefits of co-operative working spreads. A local steering group is in place and volunteers have been pro-active in creating the survey and maintenance plan at each building taking part. Many are current places of worship but others have had to find alternative uses, including as a scout hut. The need for well-planned and appropriate preventive maintenance, however, remains the same. Once a year the Maintenance Co-operatives Project holds a national conference to launch National Maintenance Week. The conference is an opportunity to bring together people who have been involved from all over the country, celebrate their achievements, share ideas and discuss challenges. Like all MCP training and events the conference is free to attend and open to anyone who is interested in maintaining places of worship of any faith, be they old, listed, historic or otherwise. The one-day national conference features speakers from a range of backgrounds, covering everything from faculties to heating, and gutters to gravestones. In the afternoon delegates have the opportunity to book a maintenance surgery with an MCP specialist or join a local tour. Whichever they choose, everyone ends up enjoying a sociable drink in the evening. It is a great way to meet people from across the country who share the same challenges. The 2015 conference will be in Birmingham on Friday 20th November. Booking will open at the end of the summer and a limited number of bursaries will be available to help cover the travel expenses of volunteers who have some distance to travel. It is hoped that at the end of the project the co-operatives that have been established with the support of the MCP regional officers will continue under their own steam, but also that other co-operatives will adopt the model independently. The project website (www.spabmcp.org.uk), complete with ‘how to set-up a co-operative toolkit’, downloadable tools and technical advice will remain live, and as ever the main SPAB technical helpline will be available to answer questions over the phone about maintaining your place of worship. KATE STREETER joined the SPAB in 2013 as project manager for the Maintenance Co-operatives Project, having spent the previous six years as manager of Burgh House and Hampstead Museum and founding chair of London Small Historic Houses. She also works as a freelance museums and heritage consultant.